Comfort and casual contemporary style come together with this great loveseat. Featuring a variety of neutral tone fabrics and tapered wood feet with a dark brown finish, this loveseat with pillow arms adds an enjoyable place to relax in your home's living space. The 64-inch wide piece also offers a cozy seating for welcoming guests. The 1070 Contemporary Loveseat with Flared Arms by American Furniture at AHFA in the area. Product availability may vary. Contact us for the most current availability on this product. Wood & Finish Dark finish. 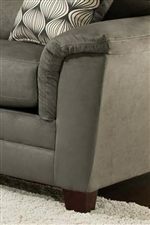 Comfort comes together with casual, contemporary style in the 1070 Upholstered Group. Each piece features exposed wood feet, flared pillow top arms and square accent pillows to add an extra pop. The style makes one feel at home and relaxed but also yields a decorative quality that appeals to homeowners seeking a modern or contemporary influence. The 1070 collection is a great option if you are looking for Contemporary furniture in the area.